In honor of my friend Aaron’s birthday (my other friend Aaron – not the one I posted about here), I thought I should post about twoÂ cupcakesÂ I made about a month ago. Since Aaron’s biorthday is today and I made these a month ago these were not made for hisÂ birthday. 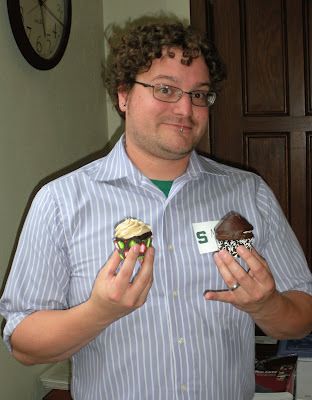 I made them for a mathematics education gathering we had and Aaron was nice enough to let me take his picture with them! I made two different cupcakes and since I had some issues with gettingÂ everythingÂ together I don’t have any good pictures of theÂ cupcakesÂ themselves. I actually forgot to take the pictures until I got them to campus. Luckily I had my little camera with me. So, my firstÂ cupcakeÂ was a gluten-free vegan cupcake. This one did not present me with any issues. I cheated a little and used a mix for this one. I was going to make them from stratch, but since I am not a big gluten-free eater I wasn’t sure what I would do with all the expensive ingredients afterwards so I opted for Bob’s Red Mill Gluten-Free Chocolate Cake Mix. Since I wanted these to be vegan as well I followed the directions for using flaxseed and water instead of eggs and I used the vegan butter Earth Balance. 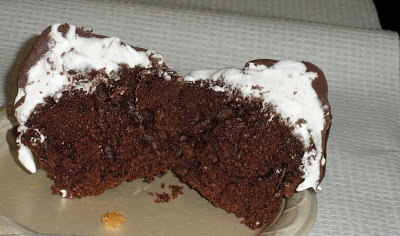 The frosting was thisÂ vegan coffee icing that I found from the Gluten-Free Goddess. Unfortunately, I don’t have a close-up of this one, but here is today’s birthday boy holding one of each. The gluten-free vegan one is on the left (in Aaron’s right hand). As someone who hasn’t had many gluten free vegan treats I thought it tasted pretty good! You can see the meringue underneath the chocolate, but as you can see it doesn’t have the height I was looking for…. Oh well. Better luck next time with these ones. I think I’ll try them on a less humid day and see if it was me or the weather! Thanks Aaron for letting me snap your pictures with these and have a VERY happy birthday today!